Did you know that the Calibra 4x4 Turbo Group A Rally Car was the first ever rally car with an active differential? I didn't think you did. With Group S banned along with Group B, Group A became the main rally class at the end of the 1980's and into the 1990's. Vauxhall/Opel entered the Astra Mk2/Kadett E GTE as their Group A car. It was front wheel drive and although proved it could cut it against the BMW M3's entered by Prodrive and the Ford Serria RS Cosworth both rear wheel drive by the time Lancia and Mazda had got their act together with the Delta and 323F both 4WD, something with a Turbo and 4WD was required. This was initial going to be the Cavalier Mk3. As discussed else where a car was produced to Group A specification and extensively tested. However, there was a change of mind and the Cavalier Mk3 Group A rally car project was scrapped. 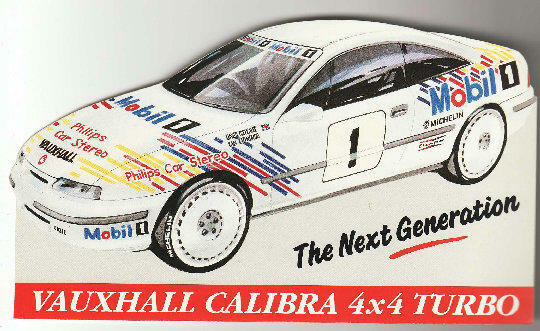 And Vauxhall/Opel approached Motorsport Development of Milton Keynes to transform the Calibra 4x4 Turbo into a Group A car. The car was 290bhp via an Xtrac/MSD 6 speed gearbox and varibale torque split 4WD system. Michelin also worked closely with the team developing tyres. Brakes were AP ventilated 4 pot disc brakes all around. Motorsport Development advised Vauxhall/Opel that the car needed a big wing, wide arches and a large turbo and presented this in a large dossier to Vauxhall/Opel. However, Vauxhall/Opel said we don't need this the car is extremely aero dynamic, it’s a decent size, has a nice small Turbo that cuts weight and is 4x4. The Turbo however was to have been the cars downfall. Vauxhall/Opel had little experience of Turbo's at the time and wanted to find a way to reduce the Turbo lag. They came up with the idea of putting the Turbo nearer the exhaust manifold as the nearer it is the less lag there is. So they located the Turbo right inside the manifold, rather than behind it! They were correct about this reducing Turbo lag, however they forgot that the nearer the Turbo is to the exhaust manifold the hotter it will get. This caused massive problems with the Turbo and effected the engines performance and reliability. Power was suggested to be in the region of 290bhp. The car should have debued on the Vauxhall Sport International Rally starting from Chester on 21st March 1992 with a full development programme through the year leading to a Group A homologation and full international competiton in 1993. We cant be cleaar if this happened or not. The cars first and as it turned out only event as a works car on the World Rally scene was the 1993 Swedish Rally. An event presumable chose as it was cool and the Turbo should not have any overheating issues. How wrong could they be though. The car was driven at this event by rallying legend Stig Blomqvist. Stage times were looking good and the car was in the top 10. Which was acceptable for a new car. For the first 20 stages the car ran like clockwork. After Stage 20 Stig informed his mechanics at Service that there was a problem with the head gasket. His mechanics checked everything but could not find any issues. They asked Stig how he knew this and he replied. I can smell it. At that point his mechanics declared him mad and send him on his way to Stage 21. On stage 21 Stig and the Calibra retired with a blow head gasket! After Sweden the car was never seen as a works car again. There were two cars built. The one Stig used in Sweden which was used by Jimmy McRae in some British Championship events and another chassis which was used in the Netherlands. It is not known if these two cars still exist or not.